What I'm trying to figure out is what the different rings around the wires mean. 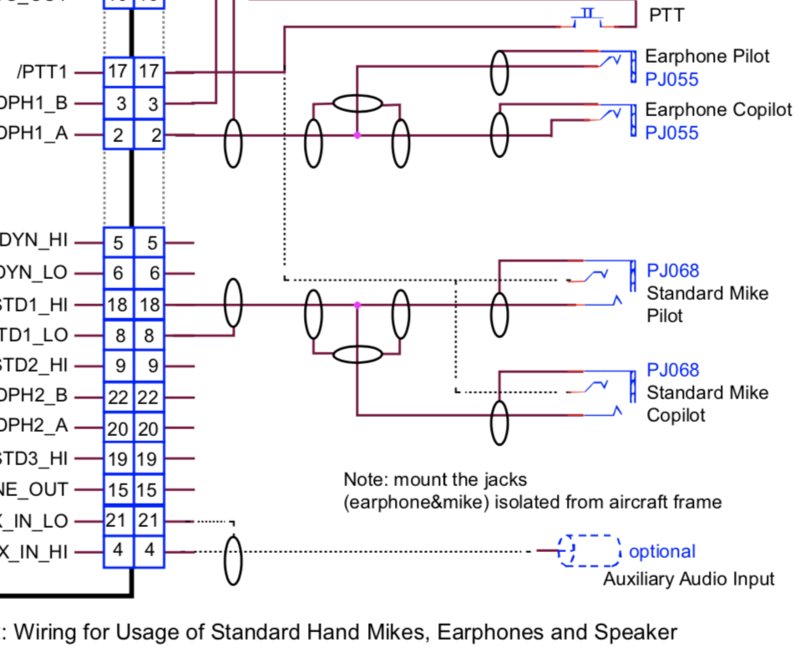 For example, Earphone Pilot has a connection that shows a ring around one of the wires, and then that hits a T connection where all of them have rings around the wires, too. I've been trying to look it up, but I'm having a really hard time finding info. The full diagram is part of the wiring diagram for a Becker Avionics AR620X transceiver, and the diagram is on page 77 of the PDF here. That's shielded wire. The ring around it is the outer shield around the cable linking the two parts together. The shield also provides the low side of the signal, so it needs to be connected to the ICs as well; it's the other half of the complete circuit. That T connection you mention is just showing that the shields for all the wires are connected together. Not the answer you're looking for? Browse other questions tagged schematics wiring or ask your own question. What do these dashed/dotted lines mean in this power cord schematic, and how should I ground this device? Is it possible to connect a 3-wire line without stripping an RJ11 line cord?